Hi, Vey nice tutorial, but i'm not able to download the app from gogle checkout, can you make sample code available through diffrent downlaod resource.....thnaks a lot in advance...will be waiting for update n a new download link.. I also can't download the source code. Could you post it as a .zip so we can just download the whole package? Thanks for the great tutorial! How would you pass the didselectrowforindexpath data along to the subview controllers in order to display information pertinent to the row selected? 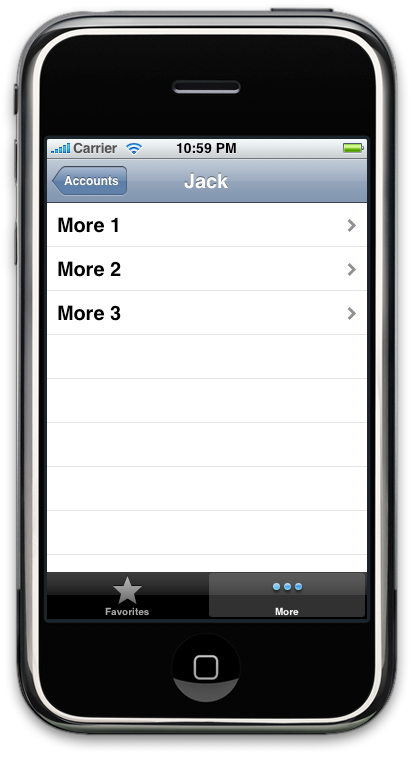 Currently, it is set up to push the TabBarController only which then controls the subviews. Any ideas would be much appreciated! Many thanks for sharing this nice piece of code. It works perfectly. is there an easier way to get my hands on theses files? Or can someone who has downloaded this already share in .zip file? Thanks for the post. I was trying to implement something like this in my app. I followed your instructions and also looked at your source code as examples. However, the problem i'm having now is when my RootView pushes the tab view controller I can't see the tab bar itself. The .xib for the tab view controller is where I put the tab bar. Also, i tried playing with the hidesBottomBarWhenPushed and that's not the problem either. I managed to attach a XML to the tableview and then I want to pass a variable from the selected row to the favorite view and put it out in a label. I suppose this could be a stupid question but im really stuck. Robert, this has been great and I have so far successfully used it with my own project but I am in the same boat as Jonah. I see you have answered him but what I would like to know is if I can point to data in a plist using your method? My main nav is populated from a plist and I would like the tab views to be populated with the rest of the data from the row selected. Is it possible before I go down the road? Thanks so much for this tutorial - it's exactly what I was looking for. However, I'm having trouble downloading the source files too. Shouldn't there be a .xcodeproj file? Maybe I'm missing something - I am a newbie, if it isn't obvious! Great article! I am building an app for my final project and this layout was exactly what I was looking for. Thanks a bunch. I am having one problem with my project as well as your sample project. I can't get the - (void)viewWillAppear:(BOOL)animate to work. Anyone have any ideas based off this example? Example can be downloaded VIA the link in the article. DOWNLOADING - You will need a SVN client to download the project files correctly. Just good free SVN client. Download and install it. Google code will give you a url that you can post into your SVN client that will download the files for you. If you found this information helpful please give back by helping others. Any information that can help my problem would be appreciated. Just as a side note to my previous post. The method (void)viewWillAppear:(BOOL)animate I added on my own as I need a way to fire some code every time the tab view switches. I am squeaky new to all this so forgive me if I am not as specific as I would like to be. I was learning about this very thing yesterday in the midst of trying to figure out other issues. My understanding is that the viewWillAppear fires on the root controller of the NavigationController and is not guaranteed to fire on any other controllers in the stack. When I added viewWillAppear on the root controller object, it fired for me. I have not done much else as I am still working on implementing the whole design of tab bars and navigation controllers. Thank you for this tutorial. I have not yet successfully implemented it yet (requires significant tweaking to fit my project), but before I get too far into it I wanted to make sure that using this type of custom workaround won't cause my app's rejection by apple. I don't mean to cause offense, I just feel the need to verify this before I move forward. I understand the Tweetie app uses a similar method, and you are obviously accomplished yourself; I'm just taking precautions. Thanks for this great tutorial. It works fine for me but one question is remaining. How can I add another navigation item in the navigation bar (e.g. an edit bar button item)? added in viewDidLoad is not working (this same approach in MoreOptionViewController shows the edit button). 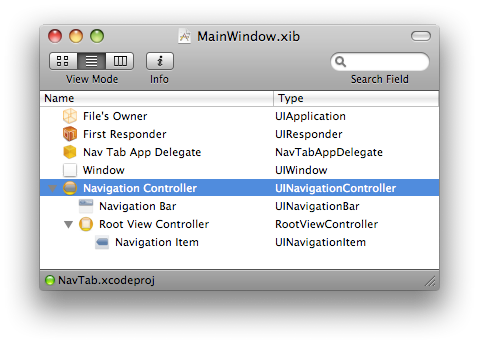 I suppose this came from using the app delegate's navigationController in MoreTabViewController inside didSelectRowAtIndexPath . The example doesn't use any unsupported/unpublished APIs or classes and in my mind it makes sense for certain UI applications - as you mention is is used in Tweetie, and it makes sense that the NavigationController is the root so that you can select an account before moving into the main function. I'd think your risk is minimal (especially considering Tweetie is up there) but then again I don't speak for Apple! However, adding it into UICustomTabViewController.m shows the edit button for both tab bar selections - Favorites and More. But for example if I wanted this button only after Favorite selection this code block is not working properly on FavoritesTabViewController.m inside viedDidLoad. What am I doing wrong here? 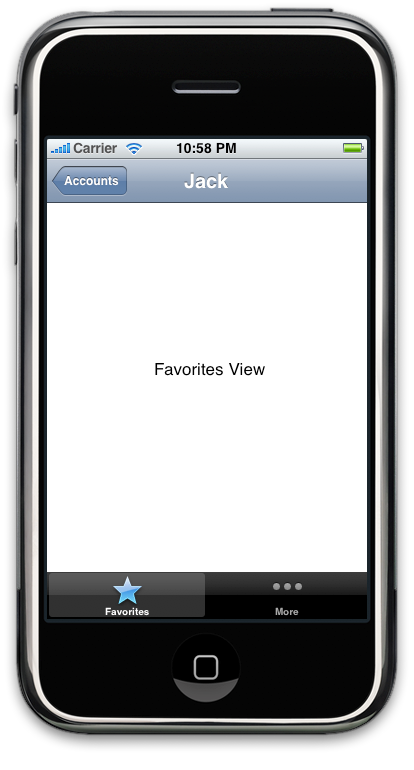 The same problem is given by setting the navigation's bar title: self.title = @"favorite" is ignored in viedDidLoad on FavoritesTabViewController.m. Please help, and thanks again! Okay, I got around this problem by writing the relevant edit button code (and self.title) inside UICustomTabViewController's initWithNibName:bundle and tabBar:didSelectItem methods. This was a big help for me as well. Much appreciated. As @psyc pointed out, viewwillappear() won't get called if you implement it in your MoreTabViewController. The problem is exactly what AC pointed out: viewwillappear() is being called for the "root" controller object which in this case is your UICustomNavViewController. Because viewwillappear() is NOT being called on the MoreTabViewController (which should then call [super viewWillAppear: animated]), the selected item is not being deselected when you navigate back from a leaf node to the moreTabViewController. Which gets the viewWillAppear message to the moreTabViewController, and the super viewWillAppear of moreTabVIewController makes sure that the selected item is deselected when it reappears. Im struggling here - could you tell me how you start the app in Xcode - i.e. what type of project template is best to start with - a Windows based App or Nav or Tab bar? I would appreciate your guidance on this.? THis would be much appreciated - otherwise love what you have done here so thanks. But there is one problem remaining. The navigation bar back button isn't colored correctly but represents the last corresponding color after a tab bar's selection. This means if Favorite was chosen, the back button color is also red in the 'More' tab view. This can only be changed to blue color if one goes back to the root view and reselects an entry. But I would like to have set the correct button color after hitting a tab bar button or after selecting a name in the root table. Is there anyone who knows how to fix this problem? I am interested in understanding if you could design and code a template for a similar but different application for me. I have all the Gfx and content and a design tree ready. turns around, so that the two Bars are still visible? I call [self presentModalViewController:aController animated:YES] from one of my tabs. When I dismiss the modalViewController, the tab bar has disappeared! Can anybody help me fix this? This is an interesting post. Thanks for sharing. I would be interested to know how you might choose to manage multiple tabs which have more memory intensive content. Currently, you allocate and initialise all content view controllers when the custom tab bar is loaded which would be inefficient in some circumstances. If they were initialised lazily, would you deallocate previous tab's content? When you push views onto the UINavController, I'm sure it does something more intelligent- perhaps autoreleasing? This is a really nice tutorial. For some reason my UITabBarItems don't become active and only the initial set one is selected without giving me the option to select any other. Has this happened to you? If so, how did you solve this? Thanks a lot for the great post, Robert! I'm using this approach in my own application, but I found that this method is actually abusing UIViewControllers. Here is full info: Abusing UIViewControllers. I really want to see what is the supported way for creating such navigation framework without abusing UIViewControllers. Do I need to create UITabBarController and then incorporate UINavigationController and then disable UITabBar on all pages except on two non-main paged down in hierarchy? But that’s ridiculous. .."application if i want to add some other tabs in your application.like you have implemented favorites , more etc. I have implemented one extra tabbaritem named others . it has successfully implemented but when i click on the others tabbaritems than the view of the others is going to be called but i lost the tabbar which appears in all favorite and more menu. but in my others view tabbar disappears.. ....!!" What should i do to see the tab bar like it is going to see in more and favorite tabbar items..?? One more question Can i change the view of tab bar items and tab bar. like i want to create tab bar in green other than the original color of the tab bar. and when the tab bar item has been selected at that time it should be yellow not than the original blue color..
i have read many comments that the tab bar color and the tab bar items color can't be changed..
but i want to be sure so i am asking.? Hoped that helped somebody! I notice a lot of you were having trouble getting it to work, maybe it's this? Thanks this helped a lot. Fixed my disappearing tab bar. Thanks for this. I had been fighting with doing this for a half hour, searching google for a half hour, repeat, until I came across this post. It is exactly what I needed. I know a lot of people who say you should never do tab controller in a nav controller, but it is sometimes the exact right solution and this helps describe how. hey did you get a chance to see about downloading the tutorial had a bit of problems downloading it. thank you for the great tutorial. The original code doesn`t work well when rotation occurs and you need your tab views to respond accordingly to orientation rotation. So I recommend to add the views from your tab`s VCs as subviews (in -initWithNibName) and manage the hidden property of the views in the -tabBar:didSelectItem: delegate method. Thus, when TabViewController gets rotated, the tab views will rotate too. Note that their VCs won`t get callbacks, though. It uses tabbar instead of tabbarController which was the major problem to be considered. This is very helpful. Do you have a similar one for xCode 4.3 using a storyboard? Thanks for such a nice tutorial. Can you update it for Swift.